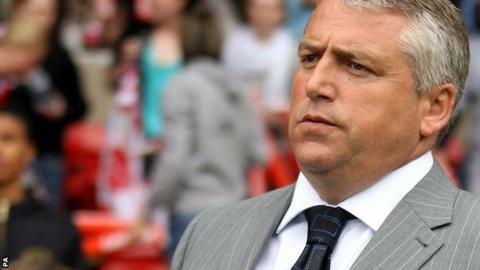 Lincoln Ladies have appointed Keith Boanas as their new manager on a three-year contract from January 2013. The former Charlton Athletic Ladies and Millwall Lionesses boss will leave his current role as manager of the Estonia women's national team and replace Glen Harris, who was sacked in October. "I'm delighted to be given the chance to manage one of the most ambitious clubs in the Super League," he said. "There is a clear belief that we can challenge at the top of the league." The Lady Imps finished fifth in England's top flight last season. And Boanas, who recently acquired his Uefa Pro Licence coaching qualification, expects an improvement when the new season gets under way in April. "It was clear early on in my discussions with Lincoln that they hold similar ambitions, to be challenging at the very top of the game and to take women's football on to the next level," he said. "I am incredibly excited about the challenge that lies ahead. "This wasn't an easy decision for me though. I have thoroughly enjoyed my time with Estonia and have a tremendous amount of respect for them. "I certainly wouldn't have considered leaving that job if I hadn't been presented with a role that I thought could allow me to make a real difference. "I was flattered when Lincoln approached me about their position and the chance to work on a daily basis with players is something that I have definitely missed." Boanas first moved into management with south London Isthmian League club Tooting & Mitcham in 1998. He began combining that role with managing Charlton Ladies in 2000 and concentrated soley on the Charlton job in 2001. Boanas joined Millwall in 2007 and became an international manager with Estonia in 2009. Lincoln have England captain Casey Stoney as their skipper and also have fellow England internationals Sophie Bradley and Jess Clarke in their ranks. "We have a great squad of players here," Boanas said. "I have obviously worked with Casey in the past, at Charlton, and that had a bearing on my decision to come here." Chief executive Luke Negus-Hill was delighted with the appointment. He said: "It was an extremely hard decision to replace Glen Harris and it was always going to take a very special candidate to replace him. "I am delighted that we have been able to secure a coach of Keith's calibre. His record in the women's game speaks for itself. "This move allows us to step up our preparations for the new season, when we will be looking to mount a serious challenge for honours in the FAWSL."